We are specializing in the production many kinds of reflective products. The most important thing is that we have a quick response and reliable team. 1. Are you the factory or trading company9 We are a factory located in Wenzhou , Zhejiang. , can also be made into all kinds of reflective products, jewelry and so on. Purchase Notes 1. Source Description We are manufacturers, all the reflective products are self-produced to ensure the delivery period and quality with short delivery cycle. 3, About color The products are taken by professional photographers and corrected, but the display color effect may differ from the actual products due to the temperature problem. About us we are manufacturer of all kinds of reflective materials. pioneered to research and develop reflective materials on May 1998 . our products have already won customer's trust and favour. Q: What is your quality control system9 A: Before production, we send the pre-production sample to customers for approval. Before shipment, we inspect the goods for third time, and we send the shipment samples to customers for confirm again. Q: Are you responsible for defective goods 9 A: Firstly, we pursue the zero defective goods in shipment. Q3: What&rsquo;s the lead time9 A: Sample : 5~7 days. Q5: Do you accept OEM9 A: Yes,OEM is acceptable. Please don't hesitate to contact us. 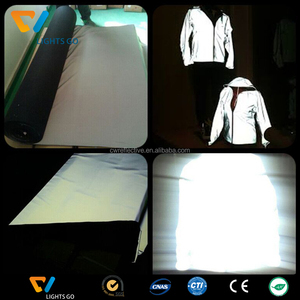 3m Reflective Fabric has been an importent product in the Reflective Material market over the past year, and it was very popular in United States,Canada,Australia,Wales and India; As shown in the distribution chart, market shares of these countries are folowing: [ US:55.81%, CA:7.28%, AU:4.98%, GB:3.83%, IN:2.04%, other:26.05%]. What's the trends of 3m Reflective Fabric product's market in 2018 (Dec 2016 to Jan 2019)?we have studied one years data on online sales, global shipping, search, sourcing and requirements of following products Reflective Tape. Reflective Product,Here is the report.During the research period (Dec 2016 to Jan 2019), the major trends are as following.